Igniting a furnace is a process for your heating system, and the reason it is a process is to ensure safety while the fuel is released and lit. Technology has helped improve the ignition process over the years, and the result is that there are three main types of ignition for gas (and other combustion) furnaces. Standing pilot ignition is the oldest type of ignition, and furnaces aren’t manufactured with this type of ignition anymore. We’ll explain why, but let’s first take a look at how a standing pilot works. As you can tell from the name, the standing pilot is a pilot light that stays lit continuously. To make sure the pilot is always lit, a furnace with a standing pilot has a small, dedicated gas valve that always has gas flowing; it also has a small component called a thermocouple that monitors the pilot light to make sure it is lit and viable. When the thermostat calls for heat, the thermocouple checks the pilot light, and if all is well, the thermocouple allows the main gas line to open so that the standing pilot can light the burner. So why aren’t standing pilot ignition systems part of today’s furnaces? Furnaces operate in cycles, so having a dedicated gas line open continuously can be a big waste of fuel, which is why this type of ignition is no longer used by manufacturers. Today’s furnaces are equipped with an electronic ignition system, and there are two types of electronic ignition: intermittent pilot and hot surface ignition. While both types are used, hot surface ignition is installed more often than intermittent pilot. The two ignitions achieve the same goal of lighting your furnace’s burner, but each does so differently. An intermittent pilot uses a pilot light that is lit only when your thermostat calls for heat. A dedicated small gas line is lit with an electronic spark and then the burner is lit. With a hot surface igniter, a small metal probe heats via electricity, and when the igniter becomes hot enough, it ignites the burner. It isn’t unusual to experience a problem with the ignition in your Columbus, OH gas furnace, but you should never endeavor to repair an ignition problem on your own. 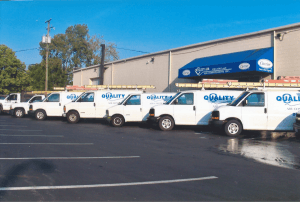 The experts at Quality Air Heating and Air Conditioning can help you with any type of heating repair you have, so call us at the first sign of problems.